Ride our majestic Drum and Gypsy Vanner horses and fulfill a lifetime dream. 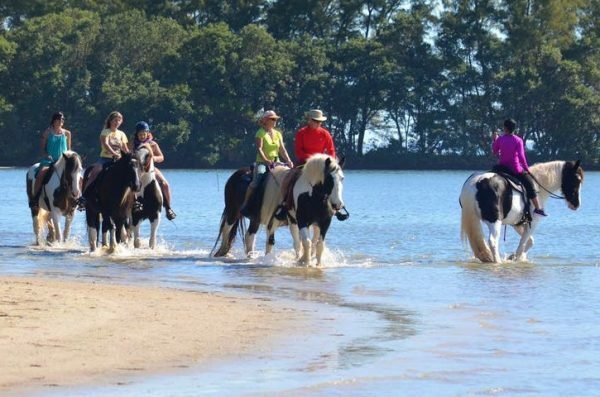 Horses will venture on the beautiful white sandy beach and into the water about 3 feet during most of the ride. You can enjoy this ride even in cooler temperatures as you do not have to get wet. No horseback riding experience is required but every rider must be able to follow simple instructions and ride their own horse. Sorry no double riding permitted. We will cater every adventure to fit your riding skills. All riders are provided with a saddle not only for your comfort, but also for the comfort of our horses. We do allow children without riding experience to ride, but they must be 10 years old and up. Children 8 and over with riding experience is fine. All riders must maintain their composure at all times. For the safety of our horses and our guests, unruly, fearful, or crying riders will be removed from the ride.Every rider is provided with a saddle, helmet and life jacket if needed. Most rides leave at 10 am, 12:30 pm, or 1:30 pm. You will be contacted to confirm your reservation time. During cooler weather, we are able to provide you an amazing ride along the shore of the beach. Visit natural Florida as you ride along enjoying the view of sea and wildlife. All we ask you to do is bundle up and see Florida from a totally different view. We will not get wet if the weather is cold. Non-refundable, cannot be rescheduled unless rider gives 72 hour notice and $25.00 per rider re-booking fee. Once purchased, tickets cannot be refunded your space is being guaranteed at the event. No shows agree they will forfeit the ride with no refund. Activity may be cancelled due to severe weather. The activity usually runs in light rain and other moderate weather conditions, but the seller may cancel the activity up to an hour before the start time in the event of severe or unsafe weather conditions. If the seller cancels the event, ticket-holders will be allowed to reschedule, gift certificate or a full refund. For safety and liability reasons we cannot accept riders under the age of 8. All minor children under 10 must be accompanied by a paying adult on the ticket.